KEARNEY, Neb. 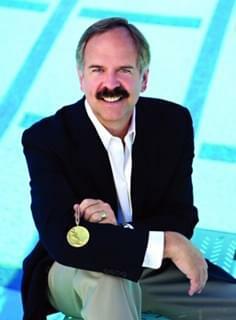 – Olympic gold medalist and television broadcaster John Naber will be the featured speaker March 5 during Ethics Day at the University of Nebraska at Kearney. Naber, who earned four gold medals and one silver during the 1976 Olympic Games in Montreal, will present “Pursuing Victory with Honor” at 6:30 p.m. in the Nebraskan Student Union Ponderosa Room. The event, sponsored by the J.A. Baldwin Free Enterprise Lecture Series Fund, is free and open to the public. A dominant backstroke swimmer, Naber set six world records, including four during the Olympics, and won 10 individual NCAA titles, 15 relay titles and four team titles while competing for the University of Southern California. In 1977, he received the AAU James E. Sullivan Award, which is presented annually to the top amateur athlete in the U.S.
Naber, whose broadcasting career spans nearly 40 years, uses his background as a world-class athlete to discuss character and ethics in a way that’s relevant to sports, business, academics and everyday life. A member of the U.S. Olympic Hall of Fame and International Swimming Hall of Fame, Naber shares behind-the-scenes stories while discussing the temptation to cut corners and the importance of achieving success the right way. Naber, who promises an entertaining and thought-provoking discussion at UNK, said motivational speaking allows him to use his past accomplishments to benefit others, whether he’s addressing college students or employees at a Fortune 500 company. “My goal is to reach as many people as possible and leave a message that lasts longer than the evening,” he said. Ethics Day is hosted each year by UNK’s College of Business and Technology.